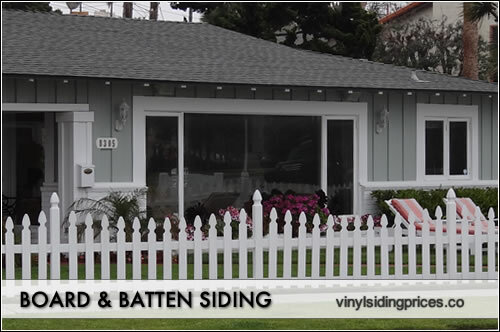 Board And Batten siding prices range from $3 to $7 per square foot installed. The two big price factors will be the material you choose. Simple plywood with battens will be pretty cheap, while primed and stained fiber cement boards or a high end wood will be much more expensive. Obviously the details on the installation itself will also dictate whether you pay at the low or high end of the install pricing spectrum. Board and battens are a type of vertical siding where the board is placed flush to the wall and the thinner batten is placed on top of the board so that it projects out from the wall. This creates a very classic look that can look cool and modern or more rural, depending on what materials and styles are used in conjunction with it. The boards and batten can be made from a variety of materials, from plywood to high end wood like an oak or spruce to vinyl to fiber cement. The Durabuilt 480 series is a board and batten that uses a 7" face and a 1.5" batten that helps to create depth and character to the exterior of the home. Board and battens often are considered a more rustic look and the 480 is available in 7 designer Durabuilt colors and a low gloss finish.